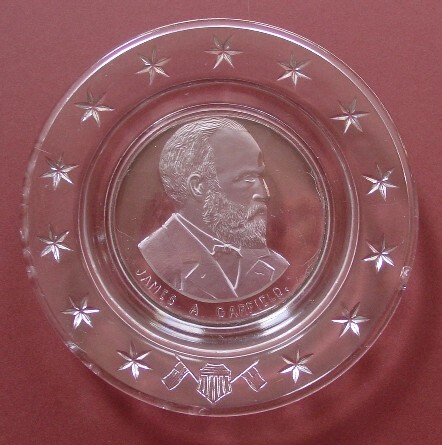 This is a six inch diameter glass plate picturing President James A. Garfield with stars around the edge and a flags and a shield on the bottom. This was probably issued after Garfield's assassination in 1881. The flags and shield could be a reference to his service in the Civil War where he served heroically and rose to the rank of General. There are some chips off the bottom edge of the glass plate which are shown in the picture above.